When is the best time to buy a Jeep Wrangler? Is it better to buy a 1-year-old vehicle or an 11-year-old vehicle? 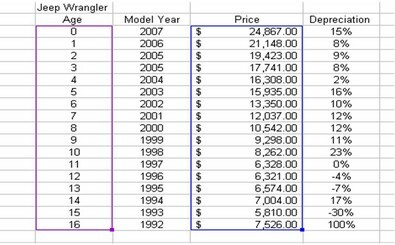 This study calculates the buying points for a Jeep Wrangler — from 2007 models back to model year 1990. There are 3 key buying points during this period that appear to provide the best value relative to the depreciation of a Jeep Wrangler. So, what type of depreciation can expect you expect? Let’s take a look at models that are less than 6 years old first. 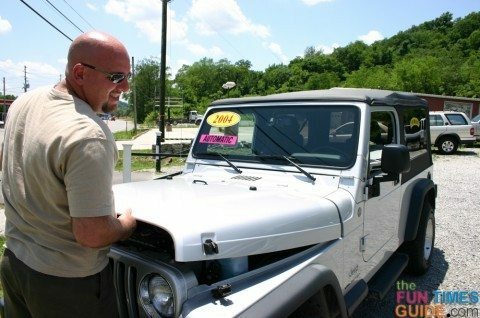 The first buying point occurs when the Jeep is 12-18 months old. The reason for this is high first year depreciation on a new vehicle. The first year depreciation of a new Jeep is about 15%. This means that you will lose approximately 15% of whatever you invest into a new Jeep Wrangler within the first 12 months of purchase. The depreciation is less than 7% on average over the next 4 years. Therefore, the best buying point for newer Jeeps is about the time it is 12 months old. The average cost of a 1-year-old Jeep is $21,148. The average cost per year (average depreciation) of a new Jeep over the first 4 years is $2,139/yr. The average cost of a 1-year-old Jeep over the next 4 years is only $1,303 per year. That’s a savings of over $3,344 just buy purchasing a 1-year-old Jeep rather than a new one! To put this in perspective, you could purchase custom wheels and tires, suspension & body lift, winch, custom roll cage, and other upgrades — just from the savings of buying a slightly used 1-year-old Jeep. For those of you looking to spend a little less money, the next buying point occurs with Jeeps that are approximately 6 years old. The average cost of a 6-year-old Jeep is $13,350. Your average cost (average depreciation) of a 6-year-old Jeep over the next 4 years is $1,272 per year. And last but not least, those of you looking for an older Jeep have several buying points at your disposal. The best opportunity occurs with Jeeps that are 11 years old. The average price of an 11-year-old Jeep is $6,328. The average price of a Jeep that is 15 years old is $5,810. That means that, on average, you will lose almost no value in depreciation over 4 years of ownership with an 11-year-old Jeep. I’m a Financial Consultant and Personal Financial Representative with experience in financial analysis, strategic planning, presenting, & financial advisory services.